KABUKI‬ Spectacle at FOUNTAINS OF BELLAGIO. Kabuki Festival Las Vegas 2015-Aug. 14th-16th. The Japan Kabuki Festival features a performance inspired by the kabuki masterpiece "Koi-Tsukami," or "Fight with a Carp," with kabuki star Ichikawa Somegoro. The show will be performed with the Fountains at Bellagio as a backdrop. *NOTE-This is a free performance and there is NO seating, only viewing from the sidewalk! Think of kabuki as a Cirque du Soleil-type performance, complete with dramatic makeup, costumes and performances. The plans are to project a backdrop on the Fountains at Bellagio. 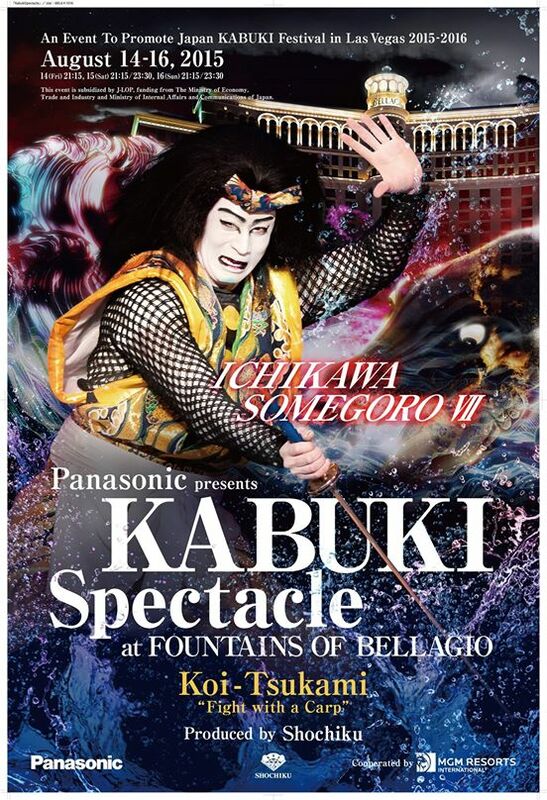 The fountains will provide a “screen” where images will be displayed, while kabuki actor Somegoro performs live out in front of the fountains. The story itself features two actors, a man who falls in love with a woman who is really a carp. She takes the form of a woman to get revenge on humans, who killed her carp fiancé. Shochiku the company that operates Kabukiza Theatre in Tokyo, which keeps the 400-year-old tradition on kabuki fresh by adding new modern features brings this amazing show to Nevada. Next May, a full-fledged Japan Kabuki Festival will be held at MGM Grand, let's all look forward to this!!! !